So much so that yesterday we announced Google Gadget Ventures, a new pilot program designed to fund 3rd party gadget developers. This is a great way to help developers pursue the growing opportunities around gadgets. Speaking of opportunity, to date, the majority of gadget development has focused on consumer or individual productivity use cases. We're seeing increasing interest in gadgets that access password protected information, often pulled from line of business applications behind a firewall. Interest here is particularly strong amongst Google Apps users, since the Google Apps Start Page effectively gives organizations iGoogle on their own password protected domain. For example, we're showcasing some of these "enterprise" gadgets in the Start Page category of the Enterprise Solutions Gallery. Entries include Appirio's gadgets for Salesforce.com and LimitNone's gadgets for corporate directories or internal RSS feeds. If you're interested in developing gadgets, check out the gadget developer pages. If you'd prefer to have someone create an enterprise gadget for you, there's a growing list of 3rd parties specializing in this type of development in the professional services category of the Enterprise Solutions Gallery. This month, we passed the 9,000 mark for enterprise buyers of the Google Search Appliance and the Google Mini. That's a great start, but we want to reach out even farther, which is why we're embarking on a partnership with Ingram Micro. One of the largest global distributors of technology products in the world, Ingram has extensive reseller relationships in Europe, Asia and Latin America that will help us deliver the power of search behind the firewall to businesses of all sizes, more efficiently and at a larger scale than we could on our own. In addition to having access to a rich network of more than 165,000 retailers and resellers worldwide, Ingram possesses core strengths in sales, reseller credit, marketing, technical support and logistics. And it has strong penetration into the small-to-medium business (SMB) and Government and Education (Gov/Ed) channels that complement our goal to offer great search technology to even more enterprise users, no matter their size, segment or location. Both the Google Mini and the Google Search Appliance are available immediately to qualified Ingram Micro solution providers in the U.S.; there are plans for a phased rollout in other regions through 2007. To find out how to obtain a Google Mini or Google Search Appliance, contact us here or here. Phil Wainewright's recent How SaaS changes the SI universe post highlights some important points about the impact Software as a Service is having on professional services. "This is typically a business with 30-60 day projects and the ability to show things to customers as they’re being developed, which is not the kind of engagement the traditional SIs are used to." "Berridge said that the focus is very much on best practice business processes and getting close to users in agile development-style engagements where they can see the applications taking shape and see the effect of changes as they happen." This agile, iterative model of delivery professional services exactly mirrors what customers love about the on-demand model. Namely predictable costs and timelines, transparency because it's easy to "take the taste test", and continual improvements based on direct feedback to the vendor. This is exactly in line with what I saw at JotSpot, and is indeed what we're seeing around Google Apps. Disruptive? Yes. But I'm personally not counting out the big SI's in this transition. One slice of the pie shrinks, while the other grows. The only question is how fast folks want to start investing in the new model. ...and eat it too. 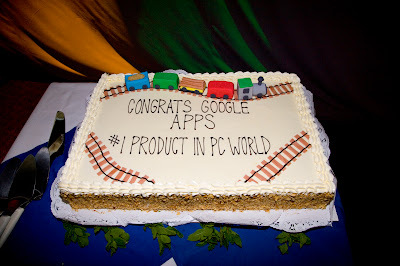 On Friday at our company-wide TGIF, we celebrated PC World naming Google Apps Premier Edition #1 on their list of The 100 Best Products of 2007. Google Apps beat out the Nintendo Wii, Apple TV, and the Slingbox Pro, further reinforcing the convergence between business and consumer technology. Internally, Google Apps is a collaboration between Google enterprise and consumer teams. It's great to see that it's paying off.